Registration Discount and Kit discount good through May 1, 2019 for early registration. Expected to begin May 2019. Pattern Book includes 24 blocks in sizes: 5”, 6 ½” and 8” for a total of 72 blocks. Let the Summer Moon 70 ½” x 78 ¾” quilt spark your imagination, and enjoy the whole creative quilting ride! Quilt Kits use MODA Fabrics by Lella Boutique - Lollipop Garden - As pictured. 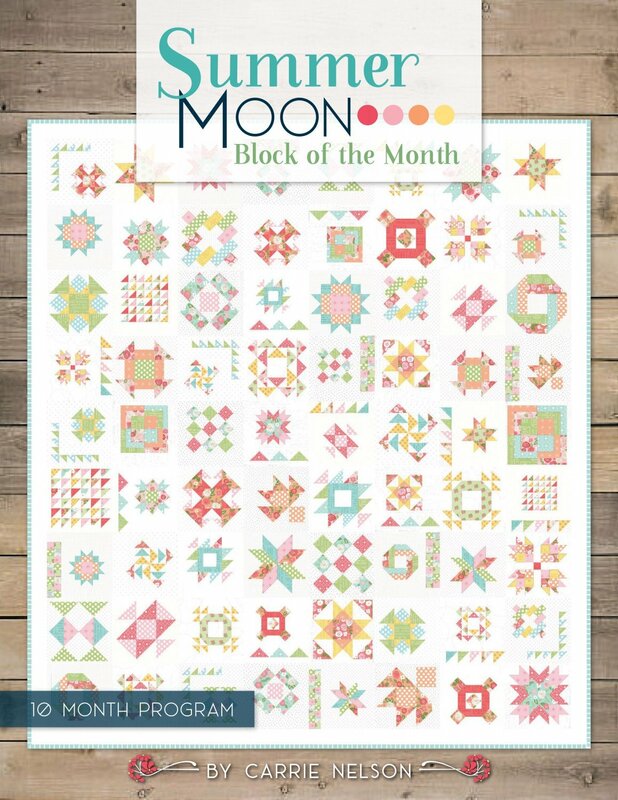 This 70 1/2" x 78 3/4" Block fo the Month kit uses apx 24 yards of fabric. Pattern breakdown for 10 months. Once Registered you will be contacted for credit card information. (Registration is Non- Refundable). During Checkout for Registration - list as Shipping - Pick Up In store so that you are not charged for shipping. Each month you will be charged $ 26.50 for the remaining months plus tax. Monthly Kit Shipment cost will be actual and at most $ 7.25 except for Final Setting which could be up to $ 14.25 for shipping. Please send us a note if you will be picking up in store or would like to have shipped. Full Kit is also Available. We may not be broken down into monthly segments. Kit is available all in one with Registration. Kit is at a 10% Discount after non-refundable registration fee = 265.00 (Save $ 26.50 = $ 238.50) Good with registration by May 1st. Please send us a note at check-out if you prefer the full kit option. Need additional help? Registration is waived with purchase of Classes. $ 15/month meets every Thursday. We will provide on-going Thursday Support beginning in May. Registration is waived with one month Class Sign up. Starts in May.